Took the Canadian Awards by storm. Good article that explains the premise without giving too much away. Season 2 Premieres April 19. It's a fantastic show and Maslany is incredible to watch as she creates all these distinct characters. It's especially amazing when two or three of them are in the same scene. I liked it a lot. Looking forward to season 2. It was a very interesting concept to begin with and the execution is simply masterful IMO. And yes, I think it helps when there's one amazing actress who plays so many roles. She's really incredible in how she shifts from one role to the next and all are clearly distinct characters. Good! I will look forward to talking about it with you. Viewers guide for new viewers or people like me who just needed a refresher. Haven't sat down to watch it yet. But might be something I attempt this weekend. I love, love, love doppelganger like situations. I hope you do. This is really better than most the network shows IMO. I wonder what's up with Mrs. S. Is she one of the bad guys? Did she start of bad, but love the children eventually and that's why she moved to the States? Wow! What an episode! Mrs. S is badass! The introduction of this religious cult has certainly amped up the intrigue. I love Alison the best. She and Felix were hilarious. Downing mini bottles of alcohol. Felix: Do you have any ideas or are you just going to keep drinking. Alison: I think I'm going to keep drinking and maybe then I'll get some ideas. 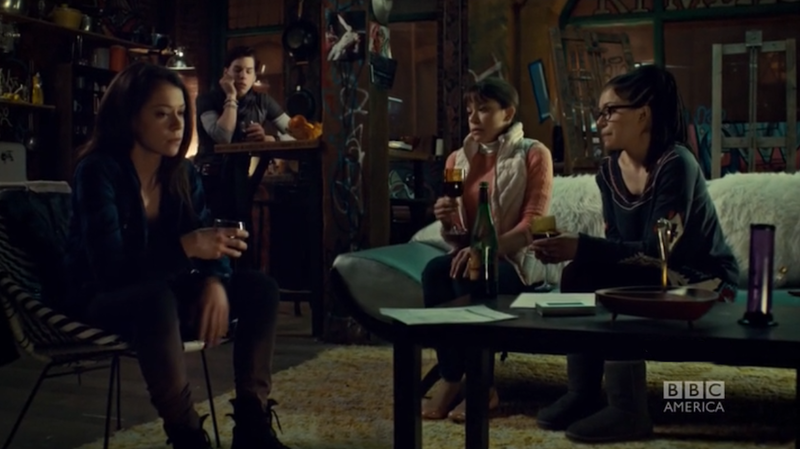 And Game of Thrones' new Daario, and ex Nashville Michiel Huisman apparently is so popular he's as of this last episode on Orphan Black (which is a bit surprising since for legal reasons they usually go for Canadian actors first.) But regardless, I am really enjoying this season. For those on the fence, I will say it's pretty easy to catch up--season one was just ten episodes. Halfway through season 1. What an exciting, thrilling ride. Maslany is so, so good. All those distinct performances; she never misses a beat. I'm furious! My cable provider doesn't carry BBC America anymore so I'm missing this season until it comes out on Netflix or somewhere. Currently on Episode 2 of Season 2. Just jumped into this show yesterday on Amazon Prime, I’m hooked!